In industrial automation, you will find dozens of protocols used by devices and PLC vendors: OPC-UA, Modbus TCP, serial, and more. In fact, often in just one facility, it is common to find two similar processes performing the same function with different equipment. AWS Greengrass reduces the operational overhead for businesses to change protocols as needed through remote deployments. AWS Greengrass uses AWS Lambda, a service that makes it possible to program devices in the cloud. For example, a business can deploy AWS Lambda functions to field devices to add additional sensors or change vendor equipment. The ability to roll out changes from the cloud to the field reduces the development and maintenance cycle for IoT applications. In this blog post, we will show an example of how you can convert data from a common industrial protocol, such as Modbus TCP. You might be able to use the same approach with other protocols. AWS Greengrass supports OPC-UA, an information exchange standard for industrial communication. Like Modbus TCP, OPC-UA allows you to ingest and process messages from industrial equipment and deliver them to devices in your AWS Greengrass group or to the cloud based on rules you define. The following diagram shows how AWS Greengrass runs a Lambda function that connects natively to devices that use Modbus TCP, such as a programmable logic controller (PLC). 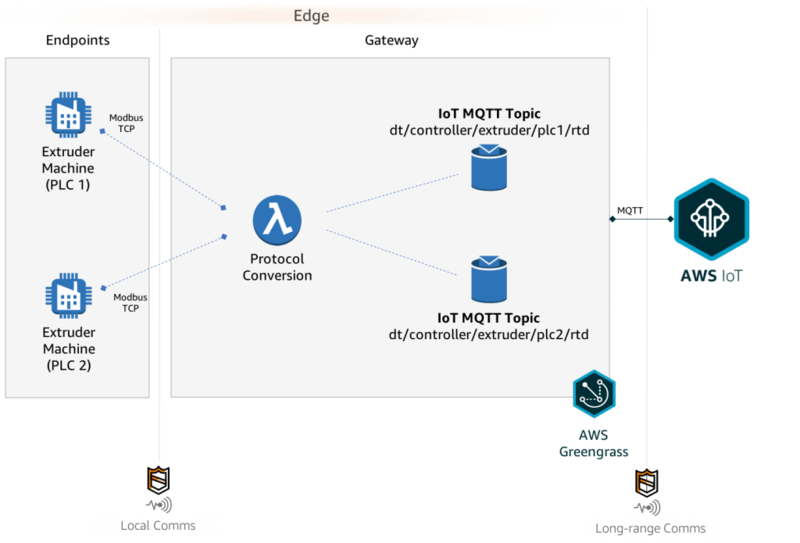 The same Lambda function publishes the values read from the Modbus Slave and registers to MQTT topics in AWS IoT Core. Lambda functions can be triggered by events detected locally or from AWS IoT Core, which can invoke writes back to the Modbus Slave device. 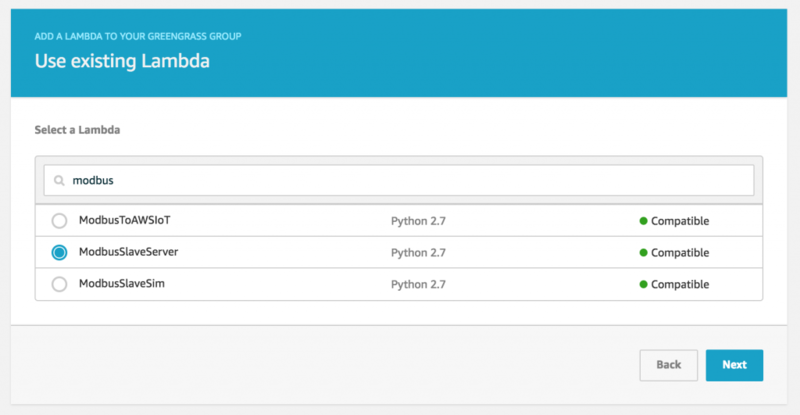 To follow the steps in this post, you need a Raspberry Pi with python-dev, python-pip, pyModbus, pycrypto, pyasn1 and version 1.3 of Greengrass Core software or higher installed. 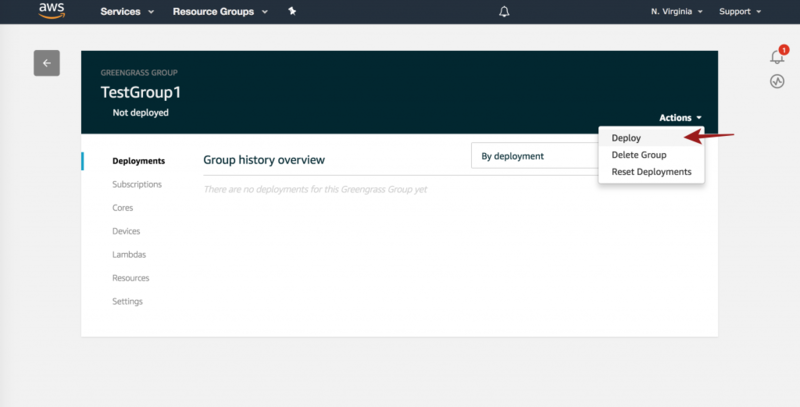 Follow these steps to set up AWS Greengrass on your Raspberry Pi. For more information, see the Greengrass Developer Guide. Create a Greengrass group. If you already have a group, you can skip this step. In the left pane of the AWS IoT console, choose Greengrass, and then choose Groups. Choose the Create Group button. Type a name for your group. Type a name for the Greengrass core associated with the group or use the default. Choose Create Group and Core. Download the core security resources, which are provided as a tar.gz. 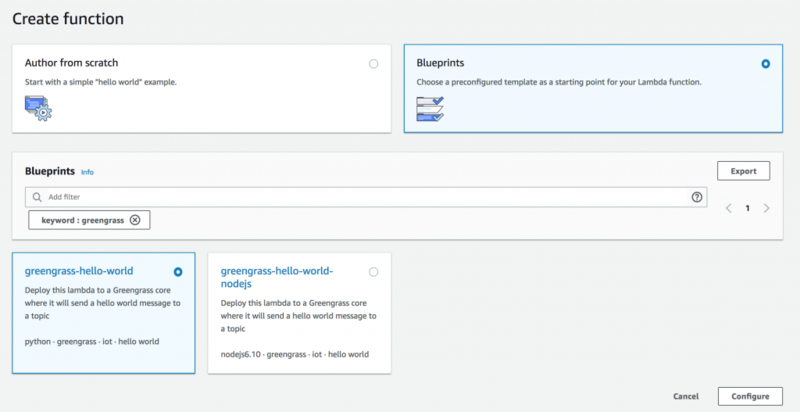 Follow the steps in the Developer Guide to load keys to your device and start Greengrass. In the AWS IoT console, from the Actions menu, choose Deploy. Choose Automatic Detection or manually set up the endpoint information for the core. Now you need to install pyModbus, a full Modbus protocol implementation. In this section, you create three Lambda functions. You can skip the first two if you are connecting to a real Modbus device. Modbus Slave (Server) – This function simulates the extruder machine PLC device. Modbus Simulator – This function periodically reads the CPU temperature of your Raspberry Pi and writes it to the Modbus Slave registers to simulate the motor bearing temperature. 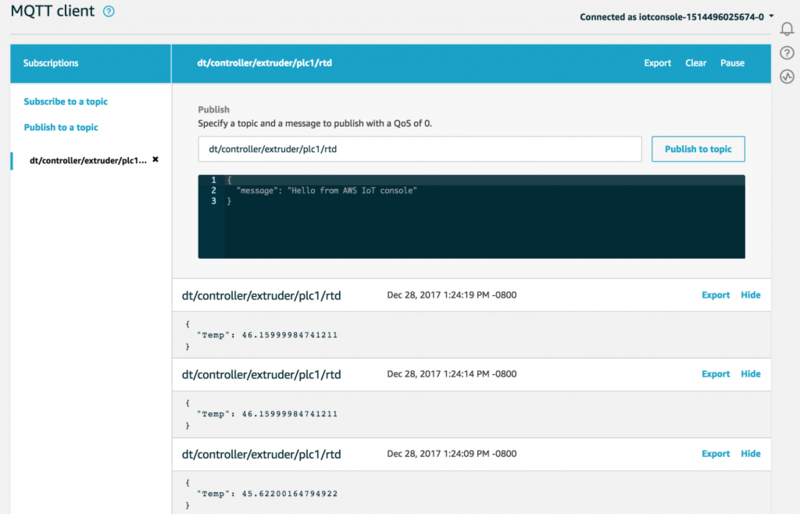 Modbus To AWS IoT – This function periodically reads the Modbus register for the bearing temperature and publishes the value to an MQTT topic. 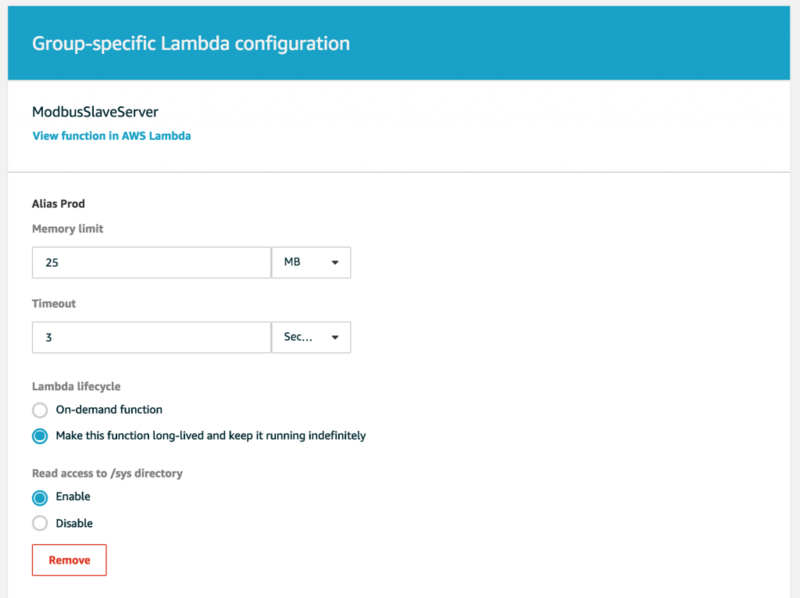 Sign in to the AWS Management Console on your computer and open the AWS Lambda console. For Name, type ModbusSlave. For Runtime, choose Python 2.7. 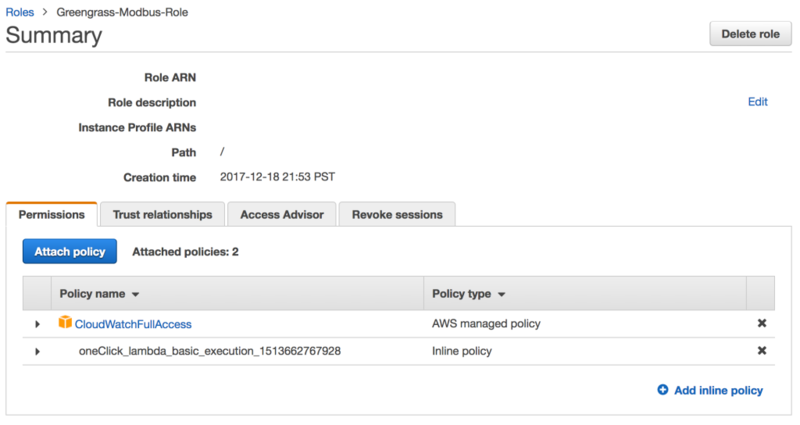 When you choose an IAM role for the function, you must provide CloudWatch log permissions. The Greengrass-Modbus-Role has the following policies attached. Be sure to apply the appropriate permissions for the role. The following script starts a Modbus TCP Server (Slave) on the Raspberry Pi. It allocates in memory some Modbus registers that can be used to read/write data to. Insert the following script and publish a new version to be used in AWS Greengrass.Tip: Create an alias for your AWS Lambda function and assign the version published to that alias. This makes it easier to deploy updates to your function later. # Copyright 2010-2017 Amazon.com, Inc. or its affiliates. All Rights Reserved. # Runs a modbus slave device in memory for testing purposes. # the server. If an exception occurs, it will wait 5 seconds and try again. # the we are executing an infinite loop. # this function is never called as it will be configured as long-lived. Repeat the steps 1-3 above to create a function named ModbusSlaveSim. The following script creates a Modbus Client (Master) that connects to the Modbus TCP Server (Slave) from the previous step and stores the bearing temperature captured from an RTD device every 5 seconds. (The RTD device in this case is just the CPU temperature of the Raspberry Pi.) Insert the following script and publish a new version to be used in AWS Greengrass. # writes the CPU temperature for the raspberry pi device to a modbus register. # If an exception occurs, it will wait 5 seconds and try again. # we are executing an infinite loop. # it to a local modbus slave device. # executing polling on startup. 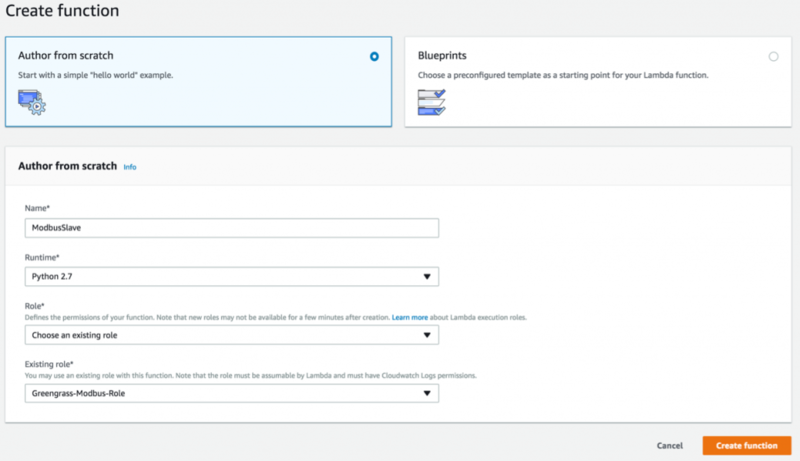 To create the final function, in the AWS Lambda console, select Blueprints. Under Blueprints, search for greengrass. Choose the Python blueprint runtime and name it ModbusToAWSIoT. 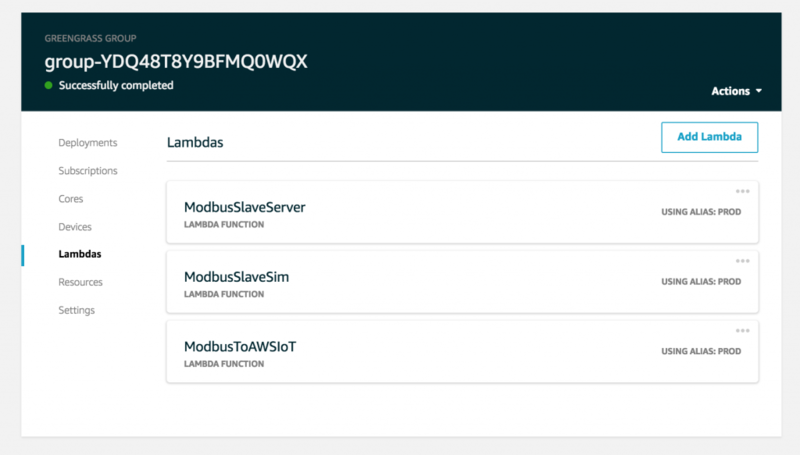 The following script creates a Modbus Client (Master) that connects to the Modbus Server (Slave) and retrieves the bearing temperature stored in the Modbus Server register. The value is then published to a topic on AWS IoT. Insert the following script and publish a new version to be used in AWS Greengrass. # a temperature value and publish to an MQTT Topic in AWS IoT every 5 seconds. # this example, 5020 was used. # modbus slave device (simulator) and publish the value to AWS IoT via MQTT. Now you are ready to deploy our protocol conversion script. Sign in to the AWS Management Console and then open the AWS IoT console. Go to the group you deployed earlier. In the left pane, choose Lambdas and then choose Add Lambda. Select the alias that was created when you defined the function. If an alias was not created, select the version that was published.Tip: We recommend that you create an alias so that you will not need to perform this step again if a new version of your Lambda function needs to be published. 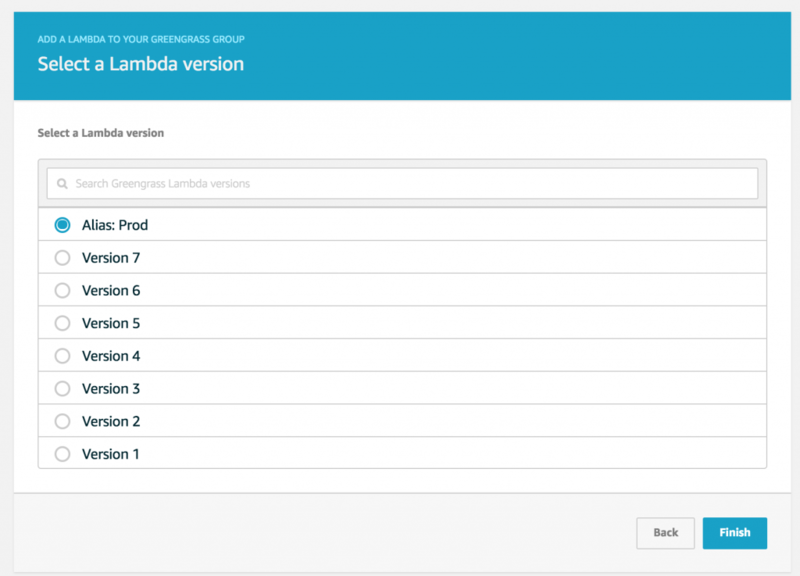 In the list of AWS Lambda functions, choose the Lambda function that was added, and then choose Edit. On this page, you can enable access to resources on the device. This could be serial or USB ports, depending on the protocol driver. This creates a subscription in AWS IoT to capture any published data coming from the Lambda function on the AWS Greengrass device. With AWS Greengrass, it is possible to acquire data from many field devices even if they are using different local communication protocols. The example in this post has shown how you can communicate with protocols such as Modbus TCP and securely transfer data to the cloud in real time. We hope you found this blog post helpful. Feel free to leave questions and other feedback in the comments.